Want to free yourself from your day job? My eguide is full of practical advice: How I Surpassed My Day Job Income in Just 6 Months of Self-Employment. “Making money online” screams SCAM! Kinda like money growing on trees, right? What I look like when money flies out of my computer. Notice as you’re browsing my income streams that only a small percentage of my income comes DIRECTLY via the Internet. And yet, I still attribute the success of my client work and most of my other writing projects to my online presence. Nearly all of my revenue sources stem from online, even if indirectly. She had already started developing a side career mixing in blogging, social media consulting, e-books and freelance editing and wanted to work on it full-time. She got all that, with writing and blogging at the core of her new career. “I don&apos;t think you really make a living as a blogger. You use blogging to help yourself make a living whatever way you can,” said Grant, who lives and works in Rosslyn. Her blog, The Traveling Writer, serves as her gateway for selling e-books and consulting services on social media to small businesses. Right now my products account for about a sixth of my income, but my goal is to increase this piece of the pie over the long term. Ebooks: I’ve got two available on this site — How to Build a Part-Time Social Media Business and How to Take a Career Break to Travel. Plus another in the works, which is tentatively called How to Create a Freakin’ Fabulous Social Media Strategy. With any luck some serious hard work, that should be out in May. Digital courses: I run an email-based course about how to use social media to Make Your Own Luck — how to grow your online network so good things come to you. If you want a heads up when I next offer it, you can sign up here for an alert. Newsletters: My paid letter ($5/month) is the one I mentioned above, Solopreneur Secrets, which offers ideas and inspiration for how to transition to working for yourself. I also offer a free newsletter about creating the life you want to live. Social media consulting: I help small businesses build communities online through Twitter, Facebook, Pinterest or whatever makes sense for each client. At this very moment, I’m looking for one more client, so if you know of a company or organization that needs help with social media but can’t afford to hire a full-time employee, please pass my name along. Blog consulting: I manage and edit Brazen Careerist’s blog for young professionals, Brazen Life. This involves brainstorming ideas with contributors, considering pitches, editing content and helping grow blog traffic. Coaching individuals: I offer one-on-one blog and social media coaching for individuals by request. Freelance journalism: I’m still a journalist at heart, and I like to put those reporting skills to use every once in a while. Media consulting: Knowing how to pitch journalists and bloggers is an in-demand skill, so occasionally I work with businesses and individuals, helping them break through the media wall. I especially enjoy helping craft, polish and pitch guest posts. Affiliate sales: I bring in a small but growing bit of revenue each month by selling other people’s products — but only relevant products I believe my readers will actually want. So that’s the breakdown. Any surprises? Got questions? I’m happy to answer them. Could any of these strategies work for you? 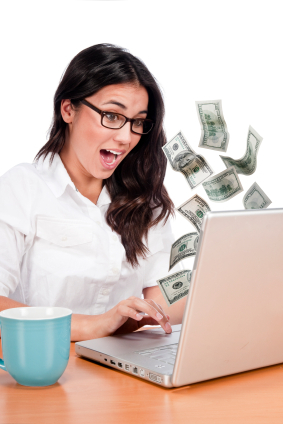 Have you thought about using your online presence to make money, either directly or indirectly? Thanks for the breakdown. It’s great to see a blogger from the DC area be successful. Good going and inspiring stuff. I am also planning to quit job for full time blogging. Alexis, Thanks once again for the insight! The theme of making money on the internet has always smacked of a scam artist at work to me. I realized a long time ago that you don’t get something for nothing. I also realize that social media is not only the wave of the future in promotion, it is imperative to marketing what ever we have to offer. In any trade or business service not only are your skills at your trade vital, you also need to be able to present them to potential customers in a believable fashion. Doing that effectively is one thing I’ve been learning from you and others, and I say again, thank you. Pingback: Blogger Alexis Grant on How to Use Content to Get Noticed [Interview] - Socially Savvy! Pingback: Alexis (it can be done) Grant – Great Interview by Dani Fankhauser « ianjcam's Blog. I love the breakdown. More people are turning to this as a source of income everyday… The key to making money online blogging is being consistent and doing something everyday to grow your business. Really great, Alexis! The point is to bring in money in every possible way you can by branching out and being open, rather than the old world conventional way of one job, paycheck, pension, and life. To me, this is awesome, one never suffers from boredom and constantly meets new people and gets ideas. Interesting breakdown. I thought about the ebook route but it looks like a lot of time invested for little return. If those products only bring you one sixth of the global income, salary per hour has to be quite low on the book. I am considering giving away a lot of free material online instead and then have people pay for freelance work. I’ve always heard those people being successful through blogging. I wonder how they do that because I’m really eager to start my online career for next year. This post helps me a lot. Thanks. I’m a editor and a freelance writer, just now breaking into the travel market looking for national publications to pick up articles. I am a good writer, have a very distinct voice and have questions. Where are the paying publications? People in this industry will tell you everything except where to find those publications that actually pay you what you’re worth. I’ve found those that will give exposure but no dollars. Like many who do this for a living tell you, know your worth and don’t settle for less. Any suggestions? Just wanted to say “Thanks” Alexis. Breaking into the world of online content-based profitability isn’t as challenging as it is confusing. Everyone plays things extremely close to the chest, and it’s nice to have bloggers who are willing to give a transparent glimpse here and there. Also, you’ve been great to work with in my limited forays with Brazen Life. I really appreciate your quick responses, feedback, and follow-through. Blessings!